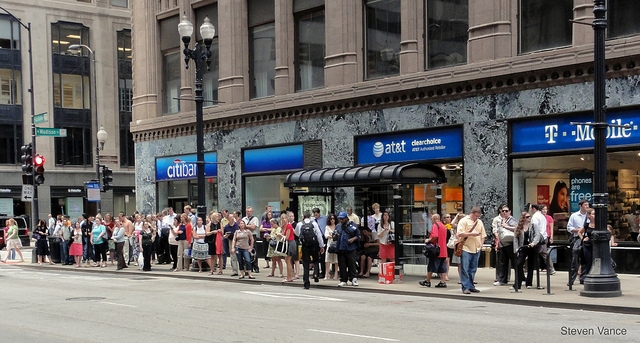 A new BRT line in Chicago's downtown can revolutionize public transportation. Photo by Steven Vance. Chicago is using $7.3 million in Tax Increment Financing to fund a downtown bus rapid transit system. TIF funds will be combined with a $24.6 million from the Federal Transit Administration. San Francisco is partnering with local car share services to offer members access to electric bicycles. The program will launch this year with 45 bicycles and will be integrated into the existing system. An additional 45 bikes will be added in 2013. The National Capital Planning Commission will vote March 1 on expanding the popular regional cycling network to include five bike stations from the Smithsonian Metro station to the Martin Luther King Jr. National Memorial in Washington, D.C.
Chicago-based architecture and urban planning firm Skidmore, Owings & Merrill (SOM) won the master plan competition to design the network of satellite cities along the high-speed-rail line that links the national capital to the port city of Tianjin. Driverless cars are quickly becoming a reality for our generation, but how will this new technology change the way we build our cities? Will it accelerate urban sprawl, since drivers will be able to travel farther in relative comfort and safety? Nearly all of Canada’s population growth over the past five years occurred in the suburbs, according to a new analysis of the 2011 Census data. Canadian allies abstained from a crucial vote on Thursday, blocking the European Union plan to classify oilsands crude oil as dirtier than other forms of fuel. Beijing is ramping up its fight against air pollution. India loses $20 billion annually due to road accidents, which the World Health Organization (WHO) estimates is enough to feed 50 percent of the nation’s malnourished children. Following a country-wide effort to replace Turkish road markers with EU-regulation signs, a report has found that many of Turkey’s most common road signs are now unrecognizable to the majority of the country’s motorists. A report from a national road safety group found an increase in fatalities among 16 and 17-year-old drivers after several years of declines. According to a new study, Florida has the most drivers age 65 and older killed in traffic accidents. A total of 1,089 people died in various accidents in Beijing last year, down 7.4 percent year-on-year. The light-rail line of the Twin Cities got a make-over to boost branding and marketing efforts. Here is another endorsement of using subway ads to spread the message of your company. Subway platforms are an especially good place for a poster because people are waiting and have lots of time to look at it. HopStop will now be able to drive greater relevance for mobile ads through hyper-local targeting on all major devices, including iPhone, iPad, Android, Windows and BlackBerry. Mobile payments are revolutionizing public transportation.